As a Bostrom Entrepreneur-in-Residence, Mr. Hunter has taught entrepreneurship courses at the Lubar School of Business continuously since the mid-1990s using the case study technique and hosting many guest lecturers including attorneys, bankers, venture capitalists and entrepreneurs. He is currently the president of three companies, CFO of one company, vice president of four companies, and director of nine companies. He has 11 years of experience in executive capacities with large companies, and over 40 years of experience as an advocate for small businesses. He has served as a mentor to the founders of start-up businesses and owners of company buyouts. 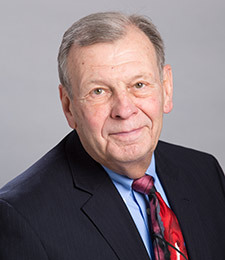 Mr. Hunter's professional activities include: past president of the Harvard Business School Alumni Club of Wisconsin; certified management consultant and past president of the Wisconsin Chapter of the Institute of Management Consultants; and a member of the Rotary Club of Milwaukee. Mr. Hunter earned his Bachelor of Science in civil engineering from Purdue University, and his MBA from Harvard University.